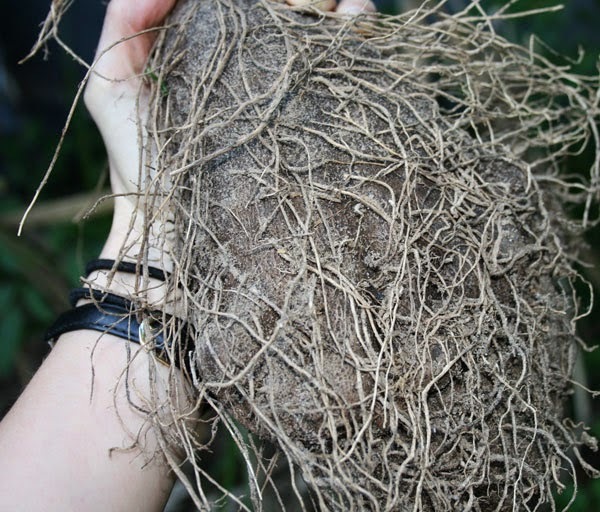 Edible air potato, also known as winged yam or "name", is a fantastic root crop for Florida. I found a nice 6lb one growing the other day and Mrs. Survival Gardener made it for dinner, taking pictures as she went. It's almost too simple to call it a recipe, but I will anyhow. 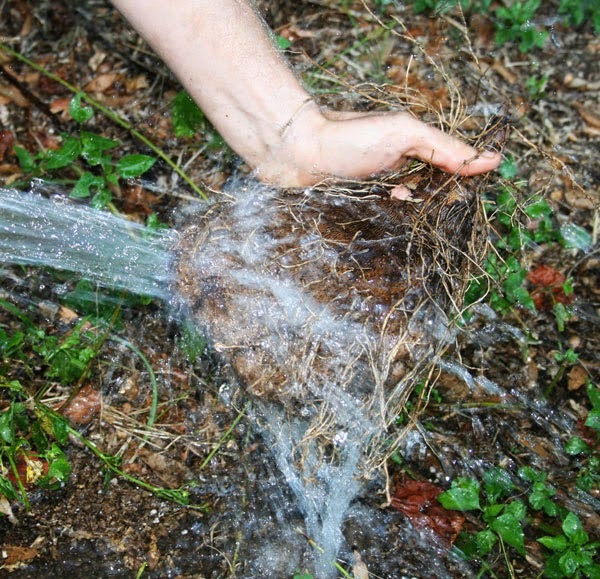 Folks keep asking me for recipes for the various bizarre roots and shoots I recommend/sell/forage/grow, so I'm going to start posting them. First, find yourself a nice winged yam root. Fall is a great time to harvest since the vines are loaded with bulbils and are easy to tell apart from their sometimes toxic cousin the "normal" air potato. After you have your root, interrupt your husband while he's watering plants and have him wash it for you. Once you have a washed root, it's time to start peeling. 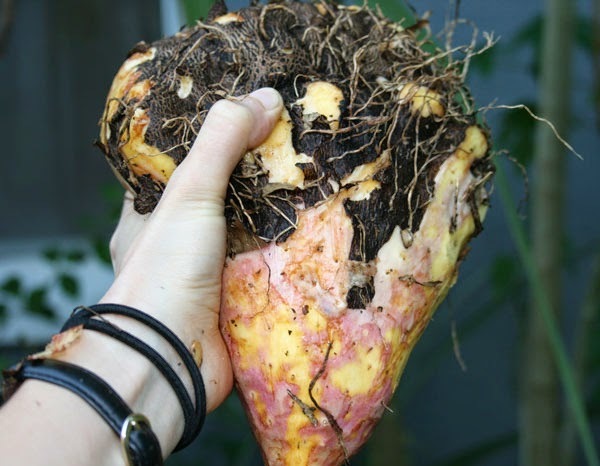 Once your root is peeled, start chopping it up. Then chop it up more. Winged yams are really slick and slimy when raw but that goes away completely when they're cooked. You want about half-inch chunks or else they'll be hard to fry. 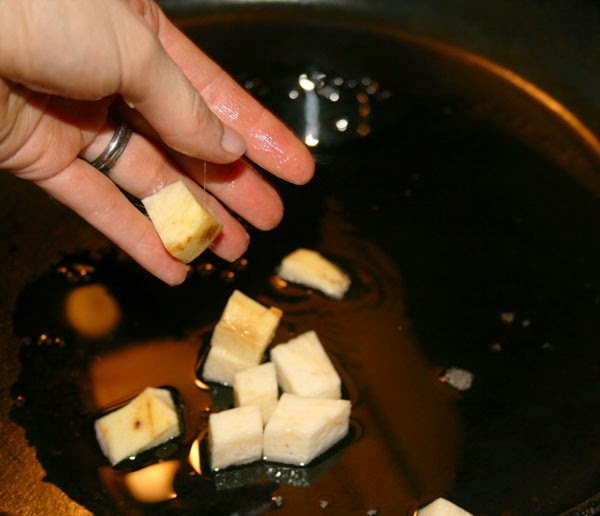 Speaking of frying, this is the time to heat up that tallow in a good pan and start tossing pieces into it. If you don't have tallow, I feel bad for you. Ours is from grass-fed beef fat I rendered down myself... it's amazing stuff for all types of cooking as well as being nutrient dense. Lard works well also, as does coconut oil, though that imparts a flavor all its own. Keep stirring your pieces around just like you'd fry potatoes, making sure they keep turning into the oil and browning without burning. 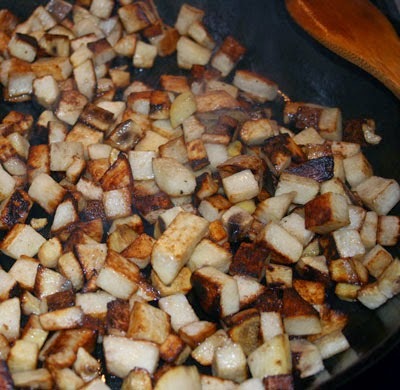 (Winged yams are excellent for frying and also make particularly good hash browns). 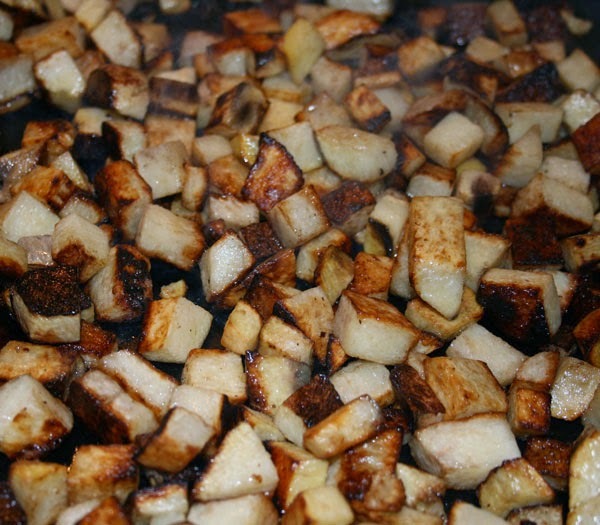 After about 10-15 minutes, you'll have nicely done homefries. 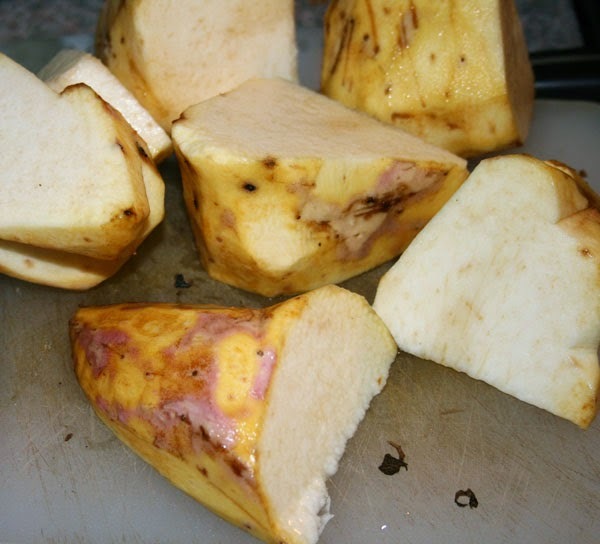 Sprinkle with garlic powder and salt and voila - winged yam homefries! I like to eat them with ketchup but my wife thinks that's evil. She eats them with mustard. That's it. The flavor is like that of potatoes but with a better, finer texture. They're excellent and don't contain solanine so they won't make your joints hurt like spuds can. In future months I'll post more recipes for various non-typical crops and weeds. Stick around! Great information David. How do you propagate these? I know you said they grow in the wild but do you sell these too? Unfortunately they can't be sold because they're supposedly invasive; however, they are scattered here and there in the woods. I can point some out to you if you're ever in the area. Great post! Pictures are worth a thousand words. I have yet to spot any air potatoes and not sure what I am looking for. Hopefully I will be able to some day. till then keep them coming here for sure. That's a really fun idea. I'll have to think about it after I finish my composting book. Thanks for the thought. From what I'm reading it can be hard to tell the from the toxic air plant... How do you tell the difference? Check this post out - you can see them side by side. Easy to tell in the fall when the bulbils are on the plants.